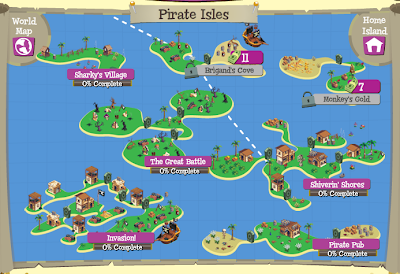 Pirate Isles! " 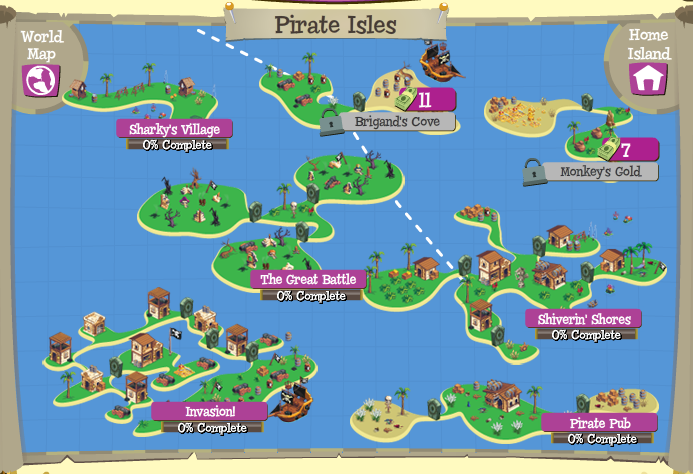 dig and you'll find cash "
Visit the Pirate Cove and get your dig on! You will have to buy a crowbar for 40,000 Coins to complete these islands. Sharky’s Village Ship Parts, Crazy Knots, Stash o’ Blackbeard. 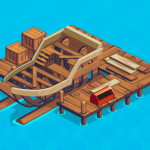 You can now build a Pirate Ship in the water around your island! 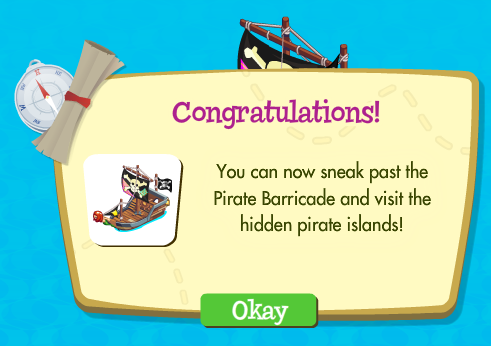 Building the Pirate Ship will give you access to the hidden Pirate Isles, “Pirate Barricade”. 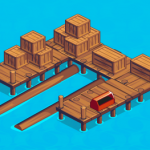 You can also get items to build your Pirate Ship from your neighbors. Each neighbor will have 2 random items (eg. Ship Nails and Paint, Nautical Rope and Sailcloth, etc…) so just ask your friends for whichever items you need. 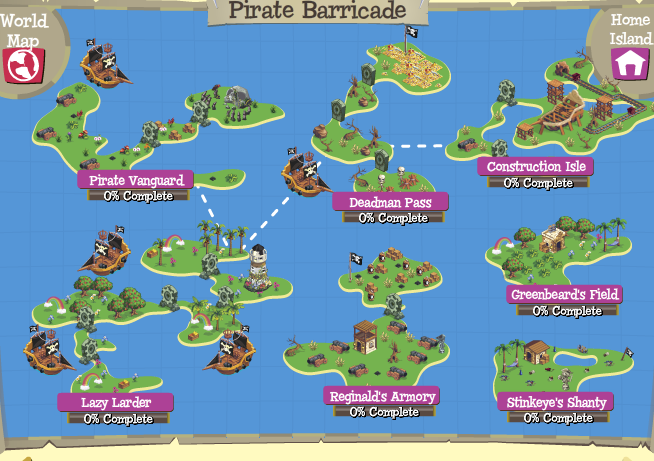 The new islands are called Pirate Barricade and contain 7 free islands. 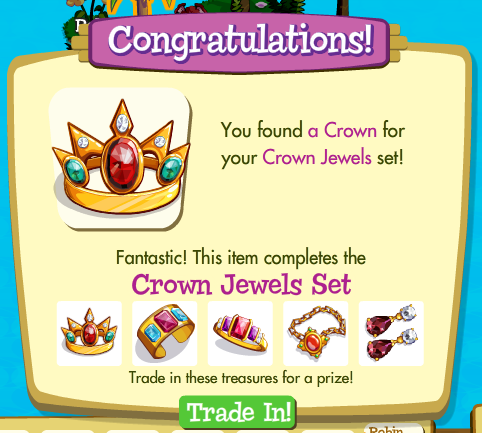 You may have more than one item in the collection, you can Trade in the treasure more than one time, thus have more experience points and of course more coins..
You can use the wishing well to wish the items you need, it uses -25 points of your Energy, but still you can gain cash from it. 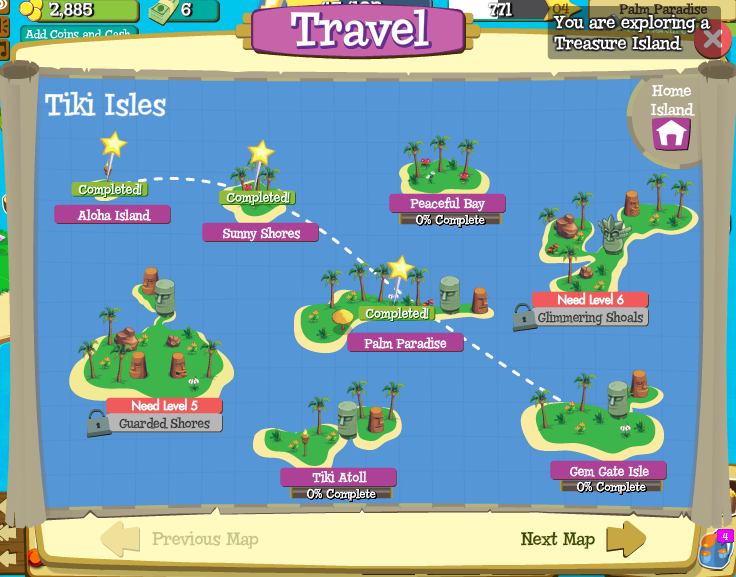 Treasure Isle, the new Facebook game from the makers of FarmVille, puts you in the boots of an explorer hunting for buried treasure across a series of tropical islands. This game combines harvesting aspects of FarmVille with a more adventure-filled theme, and that seems to be a killer combo -- attracting roughly 20 million players in a matter of weeks. 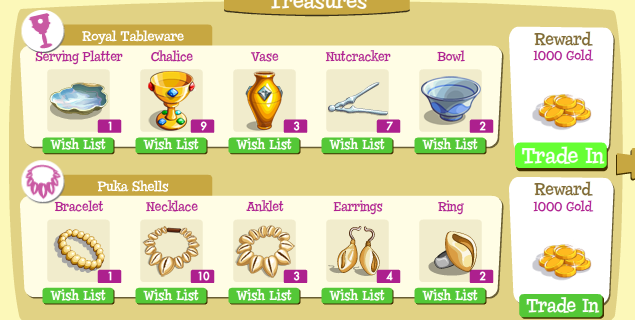 Here's six ways to get your hands on Treasure Isle's fortunes as quickly as possible. Your home island will feature two small plots of farmable land when you first begin the game -- you'll have a choice of four different fruit seeds to plant. You'll get the best return on your time by planting Watermelons. We've been finding that we play Treasure Isle in very short bursts, using up all of our energy hunting for treasures in one go, replenishing with any fruit we found, and then depleting our energy again. Bear with us as we do a little rough math -- the energy cap starts off at 100 and increases only a little with each level. Since energy replenishes at 1 point every five minutes, it'll take just over eight hours to completely fill up again, which means in about eight hours, we can come back and have another short play session. And what do you know, Watermelons take eight hours to mature -- perfect. This is crucial, moreso than in other Facebook games that you may play. In Mafia Wars, you can complete item collections by redo-ing the same tier of missions that grant those items until you finally complete the set. In Treasure Isle, you can't return to an island once you've dug/searched every grid -- this means that if you weren't lucky enough to complete the Hulu Outfit set on Guarded Shores, you won't be able to find those items yourself. Luckily you can list up to six items at once in your Wish List and ask friends to send you any extras they may find on their treasure hunts. Complete collections yield a massive amount of gold coins, so they're well worth the time invested in tracking down each item. Unlike trees in Farmville, Treasure Isle's store-bought trees don't produce any goods, experience points or money. They're purely for decoration. The trees that *are* important are the Gem trees that you'll find on your and your friends' islands. There is one per island, and the color gem that it bears is automatically decided for you when you first start playing Treasure Isle. 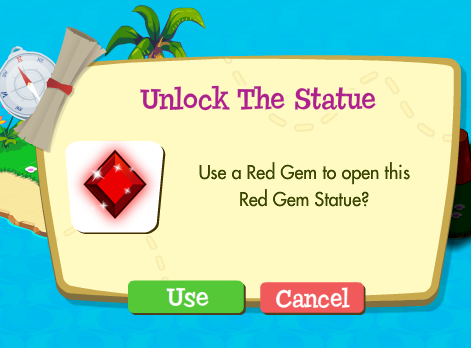 Make sure you visit your friends' islands frequently to harvest gems, especially if theirs produces a different color gem than yours. You'll need an assortment of them to open gem gates later on in the game. You'll find the Machete, Pickaxe, Dynamite and Bug Spray items in the 'Tools' section of the Store. While you're likely to be prompted to purchase each tool as you need them (Machete is needed to search for treasure in trees, for example), having them on hand boosts the chance that you'll find fruit or additional gold during the course of treasure hunting. This should be a no-brainer, but in the event that you end up finding all of the treasures on each island before actually searching each grid -- don't stop! You'll get a major experience/gold bonus for completing the island itself, not to mention those last spots may hide fruits and other gold stashes. Energy points replenish eventually, so you have nothing to really lose by digging on those last few spots. 6. Add friends early and often. We're not huge proponents of spamming non-gaming friends with invites/gift requests but in this case, having an extra friend around may mean more than just a handful of additional coins each day. Since, as mentioned earlier, each friend will be assigned a Gem tree, you'll be dependent on them to provide you the necessary Gems to unlock certain areas of later islands (unless of course you want to shell out real currency to purchase Gem packs). And of course, there's also the added bonus of XP and coins just for visiting daily.